2/25/2019 - It's a quick turnaround, as a new season opens in just 30 days. It will be the inaugural season of our league's affiliation with the Men's Adult Baseball League (MABL). 1/27/2019 - For a second week in a row, rainy weather led to a complete washout of games. The league is working hard to reschedule all games, with a new schedule expected to post sometime this week. 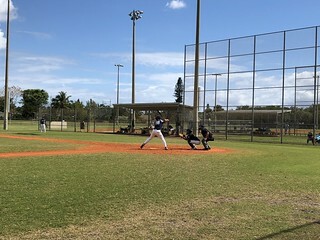 1/20/2019 - Overnight rain washed out a morning tilt against the Beach Bums at the Santaluces Sports Complex.The Thunder resume action next Sunday against the Piranha. 7/29/2018 - Rain washed out the entire league schedule, but all games will be made up and the season will be extended by one week. 7/22/2018 - The game against the Rowdy Boyz was postponed today, as the West Boynton Park field was closed for renovation. 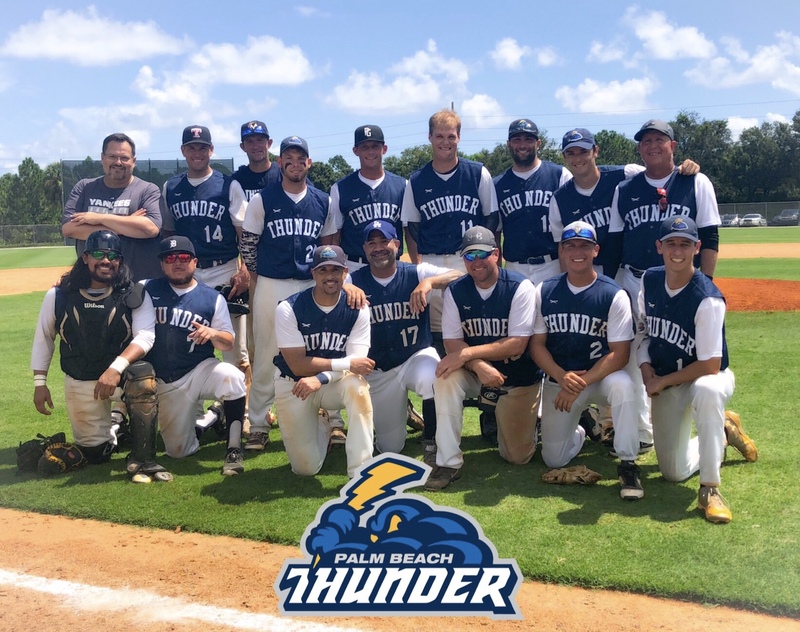 The communication mix-up forces the Thunder to finish the season with crucial back-to-back doubleheaders, as they battle between four teams for three playoff positions. 5/20/2018 - All games were rained out today and will be made up on the last day of the regular season, Aug 5th, as part of a same-team doubleheader. With no games scheduled next week because of Memorial Day, play resumes June 3rd and will run weekly throughout the remainder of the season. 3/21/2018 - The 2018 Spring Season opens this Sunday, 3/25/18, with a home game at Santaluces against a hungry Scores team. Despite finishing their inaugural season with a 2-11 record, Scores management has made some adjustments and expects to have a more competitive second season. For the Thunder, an off season semi-merger with five core players from the Athletics creates a competitive roster, and will allow the team to roll out a more consistent lineup on Sundays. 2/15/2018 - Recovering from foot surgery, Sergey played only a few games for the Thunder and never made an appearance on the mound. 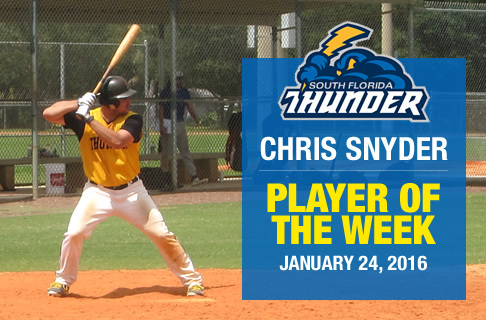 But that didn't stop the Skeeters, which play in the Freedom Division of the Atlantic League of Professional Baseball (ALPB) from adding him to thier 2018 roster. Good luck Matt! 11/5/2017 - Four players from the Thunder, as well as players from other league teams, joined forces with the Red Sox to bring home a championship in the 28 Division of the NABA Florida World Series, which was played Nov 2 through Nov 5th at Roger Dean Stadium. 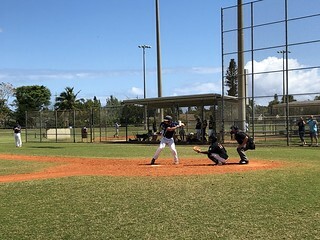 Greg Nicholson, Roy Nino, Erick Abreu and Shaun Garceau were late additions to the roster, but each played big roles as the Red Sox went 4-1 during pool play, then 2-0 in the playoffs. Shaun Garceau picked up the win in the championship game, and was named MVP of the game. 10/29/2017 - Rain washed away a morning game against the Rowdy Boyz. 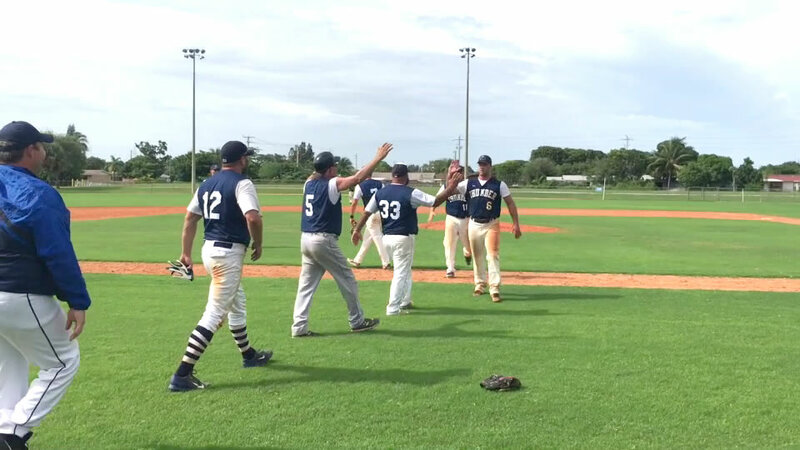 The league has off 11/5 for the NABA Florida World Series, but resumes action on 11/12. 10/12/2017 - Opening day for the Thunder's 14-game fall season is set for 10/15, with a morning game against last season's American League Champions, the Cuban Blades. The fall season will be the Thunder's 28th season in the league. 8/20/2017 - Mother Nature did the Thunder a solid today, as the team sneaks in as the 5th seed after the league expanded the playoffs due to multiple games being postponed throughout a very rainy season. A new playoff schedule will be announced soon. 4/23/2017 - All league games were washed out today and will be rescheduled for May 28, 2017. Next up, an afternoon battle against the undefeated Tigres next Sunday at the Santaluces Sports Complex. 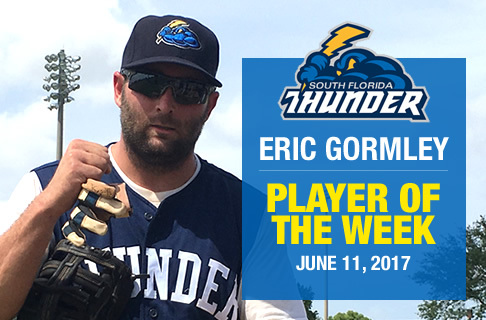 3/21/2017 - The 27th season of the South Florida Thunder begins this Sunday, March 26, against the newly formed Cerveceros. The game will be played at the Santaluces Sports Complex, with first pitch at 9:30 AM. 12/17/2016 - The South Florida Thunder will resume operations this spring as manager Mike Soulen has returned to the area. The newest version of the team will consist of many Thunder veterans and talented newcomers, forming what should be a competitive club for the spring season, which opens March 2017. 02/07/2016 - The Thunder were unable to field enough players for their final season match-up against the Mets. The season mercifully came to an end this past Sunday as the Thunder forfeited to the Mets, 9-0. 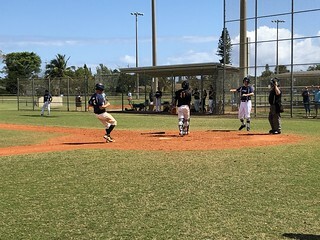 The forfeit gave the Thunder a final record of 3-10, a complete turnaround from the previous season's 11-7-1 record which saw the Thunder lose in the second game of a doubleheader playoff game against these same Mets. Thank you to those that were committed, and to Eric Morales who valiantly tried to keep the club alive after Mike Soulen's departure to Texas. 8/16/2015 - Today's game against Team USA was rained out. Playoffs start next Sunday morning as the Thunder face a hot Sugar Kings team in the division semifinal. Winning team will play the division final in the afternoon. 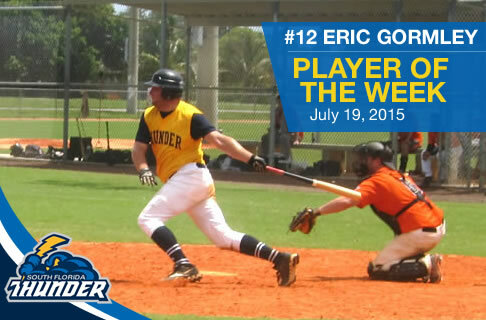 7/19/2015 -Collects six hits and drives in two runs for the day as Thunder splits two games. 6/28/2015 - Today's afternoon game against the Orioles was rained out. The team has off next Sunday for the holiday weekend then resumes action on July 12th against the Islanders. 6/7/2015 - No earned runs and 10 strikeouts to run his record to 2-0 for the season. 5/29/2015 – Congratulations to Thunder outfielder BJ Smith and his wife Maura on the birth of their baby boy. The baby was born a healthy 9 lbs 12 oz. 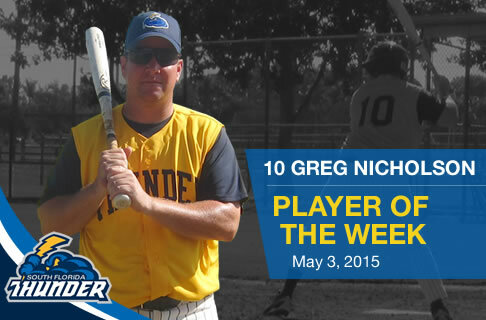 5/3/2015 - Goes seven for nine with five runs batted in doubleheader to earn League Player of the Week (AA). 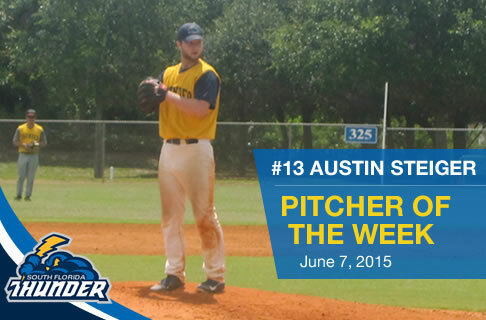 5/3/2015 - Throws two hitter to go 5-0 for the season to earn League Pitcher of the Week (AA). 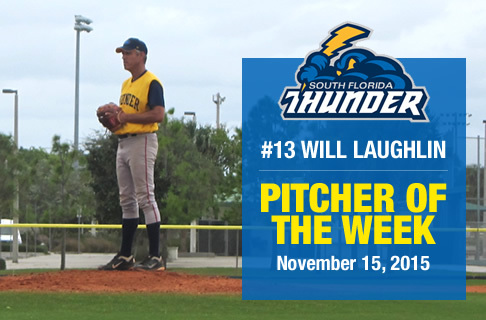 1/18/2015 - The Thunder were awarded 9-0 and 7-0 forfeit wins Sunday due to the Hurricanes folding earlier in the season. 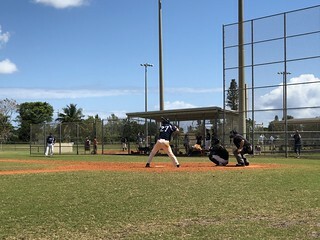 The team will battle the top seeded Athletics Sunday morning in the quarterfinals at the Santaluces Sports Complex in Lantana, FL. 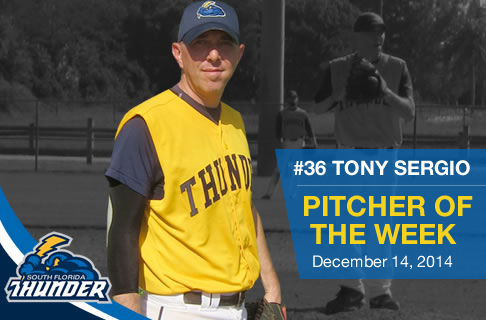 12/14/2014 - Strong seven inning outing with nine strikeouts in Thunder win over Islanders earns Tony League Pitcher of the Week (AA). 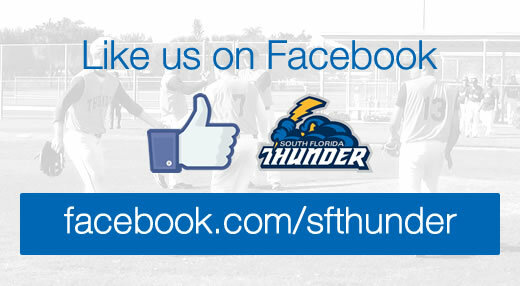 10/30/2014 – The Thunder are now on Facebook. Please like us and invite your friends and family to also like us. 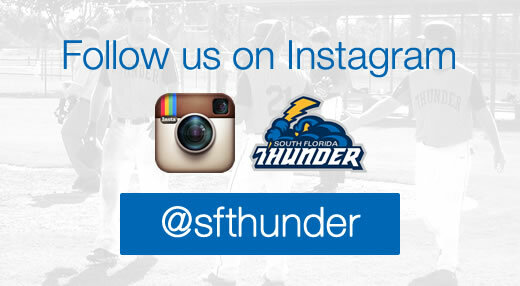 10/30/2014 – The Thunder are now on Instagram. Please follow us and invite your friends and family to also follow us. 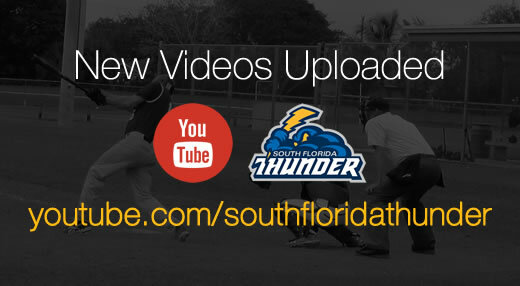 10/28/2014 – Visit our YouTube channel to view new videos taken from Sunday's game against the A's. 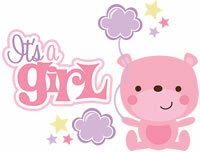 8/26/2014 – Congratulations to Thunder infielder Rudy Plasencia and his wife Irene on the birth of their baby girl Gloria Mia. The baby was born a healthy 7.2lbs and 18.5in. 8/9/2014 – RHP Paul Chasse and RHP Will Laughlin recently joined the Thunder to help bolster the pitching staff after Tony Sergio was forced to the DL due to back problems. The Thunder made another move before the deadline, acquiring lefty Mike Alfinez who will help solidify the pitching staff throughout the playoffs. 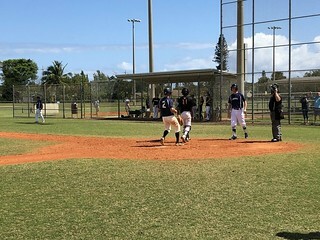 The added arms are necessary as the Thunder would need to win a doubleheader in order to advance to the Championship game. Additionally, the team added OF Matt Rankin and C Anthony Terrazi for added flexibility with their roster. 8/5/2014 – Due to recent rain-outs and the fact there are only two weeks left of the season - the league has decided to cancel rained-out games and expand the playoffs in the AA division to twelve teams, adding two more in each division, which will have six teams each. The top two finishers will draw a quarterfinal round bye in both the AA North and AA South, with the remaining four in each division playing quarterfinal games. Additional, those teams who had games rained out on August 3, the last day new players would be eligible for playoffs, are allowed to add players on August 10. 2/21/2014 – Opening Day for the 2014 spring season is slated for March 23rd. The Thunder will be returning to the 18AA division where they played in the championship game two seasons ago. 12/15/2013 – With multiple players out of town and back-up players unavailable, the Thunder had to forfeit for the second time this season. 12/08/2013 – This season’s All Star game will be played Wednesday, December 11, 2013 - 7:00 PM at Dyer Park in Riviera Beach, FL. Player allotments were announced and the Thunder will be sending three players. 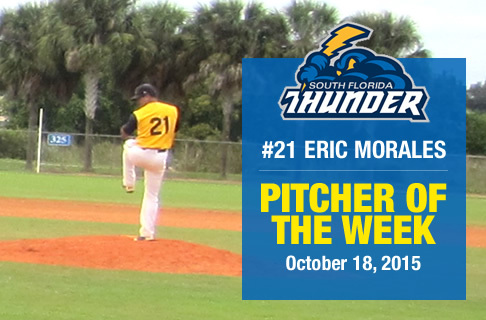 Nominated players were Eric Morales (3B), John Dolan (OF/P) and BJ Smith (OF). 10/27/2013 – The Thunder came up shorthanded as six players couldn’t make the game today, giving the Senators an easy forfeit win. 10/1/2013 – Thunder Return to AAA Division. After a successful return to the league and a strong season in the AA division, the Thunder will return to the AAA division for the fall season. 7/28/2013 - The distant rumbling of thunder wasn’t the sign of good fortune the Thunder had hoped for as the skies opened up and washed away their one-run third inning lead Sunday morning against the Nationals at Little Fenway in Delray Beach, FL. The cancellation marked the fifth rain-out of the season and the game will not be made up due to scheduling and field availability issues. 7/14/2013 - With an all day rain on Saturday and a 60-70% chance of more rain on Sunday, the league decided to postpone all ten games schedule for July 14. A decision on rescheduling games will be made later this week. 6/23/2013 - The game against the Leones was postponed due to wet grounds at West Boynton Park in Lake Worth. 6/9/2013 - Tropical storm Andrea leaves Santaluces field underwater forcing the postponement of the entire schedule on Sunday, June 9. All ten games will be rescheduled for August 11, extending the spring season one week, and pushing playoffs back to August 18 and championship games back to August 25. 6/3/2013 - This season’s All Star game will be played Wednesday, June 12, 2013 - 7:00 PM at Dyer Park in Riviera Beach, FL. Player allotments were announced and the Thunder will be sending five players. Nominated players were Eric Morales (3B), Steve Arnold (LF), Louie Napoleon (SS), Rudy Plasencia (2B) and Jeff Tomlinson (LHP/1B/OF). Jeff Tomlinson will be out of town so backstop Jason Russianoff has been named his replacement. 6/2/2013 - The Thunder were awarded a 9-0 win today when the Angels were unable to field a team, bringing the Thunder to 9-0-1 at the midway point of the season. 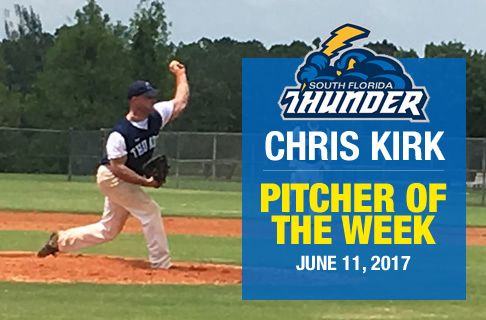 5/24/2013 - NABA Player of the Week Jeff Tomlinson - JT cops third Pitcher of the Week award; seven shutout innings + two hits, two RBIs.